The dedication of children is an act in which parent(s) publicly present their child and themselves to God as an outward expression of their gratitude and desire to raise their child in becoming a disciple of Jesus Christ. It is a public act of dedicating the child before God and the faith community. It is a promise to love the child as Jesus has loved us. It is a promise for the parents to live out their faith at home and to lead their child by example in what it means to be a disciple of Jesus Christ. It is a time of partnering with the Spring Garden faith community, promising to work together in helping the child in his/her faith journey. If you are interested and have any further questions or concerns, please speak with our Pastor of Discipleship, Sam Lee for more details. Here at Spring, we believe that communion is a way in which all who are followers of Jesus Christ can come to a table of fellowship and share together what Jesus has done for us and continues to do in and through us. Most Christian churches participate in this act and refer to it by other names such as “The Lord’s Table” and “the Eucharist.” We believe that we are all on a journey and what’s important is that we are moving towards a deeper relationship with Jesus. We believe that children can come and are welcomed to the table and that it is up to you, parents and caregivers, to discern with your child when it’s the right time to participate in communion. Whether or not your child is ready, we want everyone to feel welcomed at the table and so we provide a blessing for those who choose not to receive the bread and the cup. We want to partner with you and encourage you to have this discussion with your child as part of his/her discipleship. We have a few thoughts about communion that we want to share with you and for you to consider as you discuss this with your child. Communion is a means of Grace. We believe that Communion is a powerful act. We believe that Jesus is present in the bread and the cup as a grace freely offered to all. In that holy moment of eating and drinking, we together as the body of Christ are sharing together the life, death and resurrection of Jesus. It’s not our table. A common invitation within many traditions around communion is this phrase: “This is not our table, it is the table of the Lord.” Jesus practiced open table fellowship in his lifetime and calls all of us to eat, drink and be in communion with Him and with one another. It is not up to us to decide who can and cannot come to the table of Jesus. There’s no kiddie table. We believe children & youth are not only the church of tomorrow but the church of today. 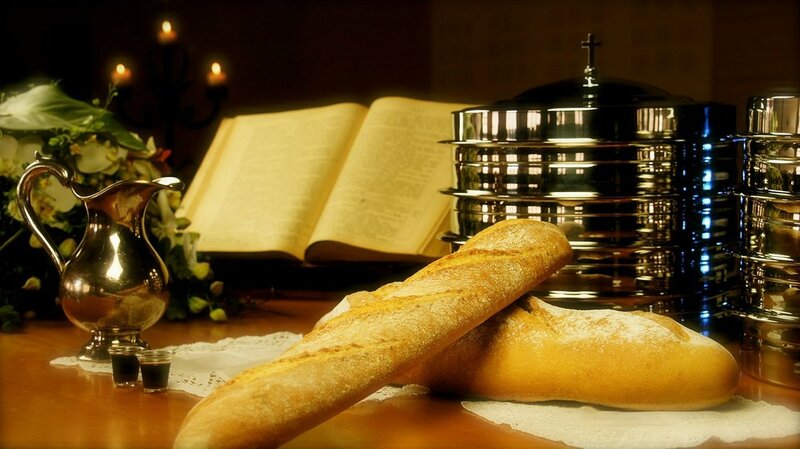 Therefore, we provide a blessing for those who are not ready or do not feel as though they are ready on a particular Sunday to receive the bread and the cup. No one fully understands what’s going on at this table. People often say, “We don’t bring our kids until they know what’s going on.” We believe that communion is more than just a symbol or a remembering act. We believe that none of us fully understand what’s going on. We receive communion in faith, trusting that something mysterious happens as we remember and celebrate together what Jesus did for us. The triune God is present in the bread and the cup, but there is an element of mystery in the act that is unknowable. There is no comprehension test that needs to be passed in order to join Jesus at His table. The act in itself is an act of faith, a way of receiving grace and a witness to the life, death and resurrection of Jesus Christ. You can watch a video clip from What’s in the Bible with your child and ask some questions based on the video. What did Jesus do at the passover meal that was different? What does it mean that Jesus is the passover lamb? What happened when Jesus died on the cross? Why do we celebrate Easter Sunday? How do we become part of the new Kingdom of God? Why Do We Receive Communion? Teach your child that we receive communion because Jesus instructed us to and because it is a way of remembering and celebrating what He did for us as well as his presence with us as the body of Christ. 1 Corinthians 11:26 tells us that as often as we eat of the bread and drink the cup, we proclaim the Lord’s death until He comes again. Read through 1 Corinthians 11:28-29 with your child to talk about the posture and spirit in which to receive communion. Communion is done differently at every church and that is ok. Coach them through the logistics and timing of when to get the bread and the juice.